Happy Monday of Thanksgiving week!! 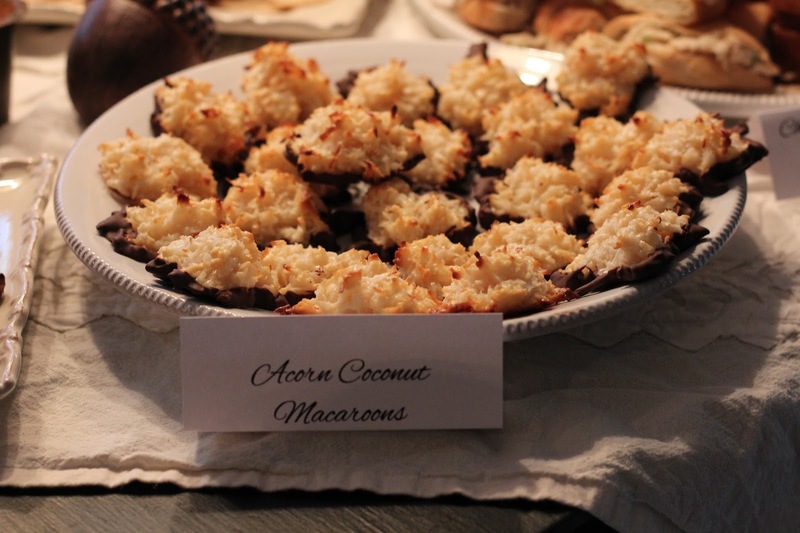 We dubbed them "Acorn Coconut Macaroons" for the woodland themed baby shower last weekend. So Saturday on my Apple Butter Ham & Swiss Sliders recipe post, I mentioned the yummy Sea Salt Caramel Coconut Macaroons that I also made for the shower I hosted last weekend. This is by far one of my favorite recipes ever! I’m very excited to share it with you because it is so easy to make! Traditional macaroon recipes use egg whites and no flour and are a longer process to bake. For my quick and easy recipe, I use condensed sweetened milk and a small amount of flour. These delicious macaroons are now my go to treat whenever I need a sweet for any kind of function – work, family, or friends – or just craving some yummy coconut all for myself! I first made this recipe when my boyfriend wanted Coconut Cream Pie and I just wasn't up for going through that process! 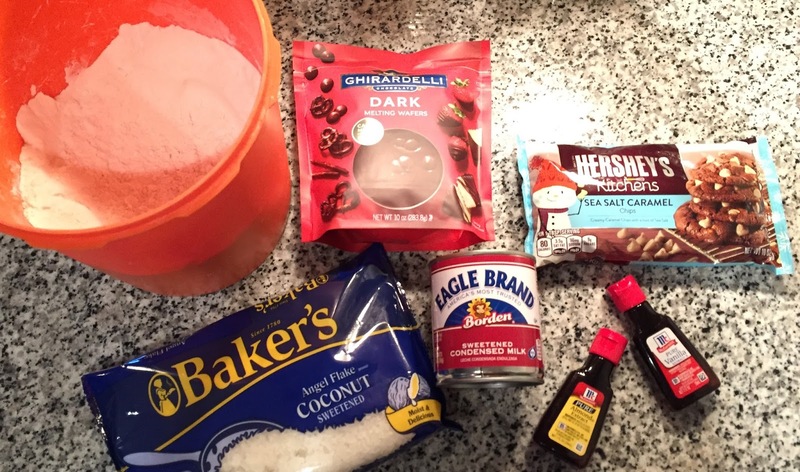 I already knew I had everything for these – having a love for baking, I keep a lot of ingredients for sweets around. That first time I made them as just plain ol’ coconut macaroons without using chocolate for dipping or the delicious sea salt caramel chips. The second time, as I was wandering through the baking isle looking for the perfect chocolate to dip them in (I highly recommend using Ghiradelli – it just puts the chocolate taste over the top! ), I spotted the sea salt caramel chips. Now I am a sucker for anything with sea salt, but salt with the sweetness of chocolate – YUM - Best combo ever invented I tell ya!! 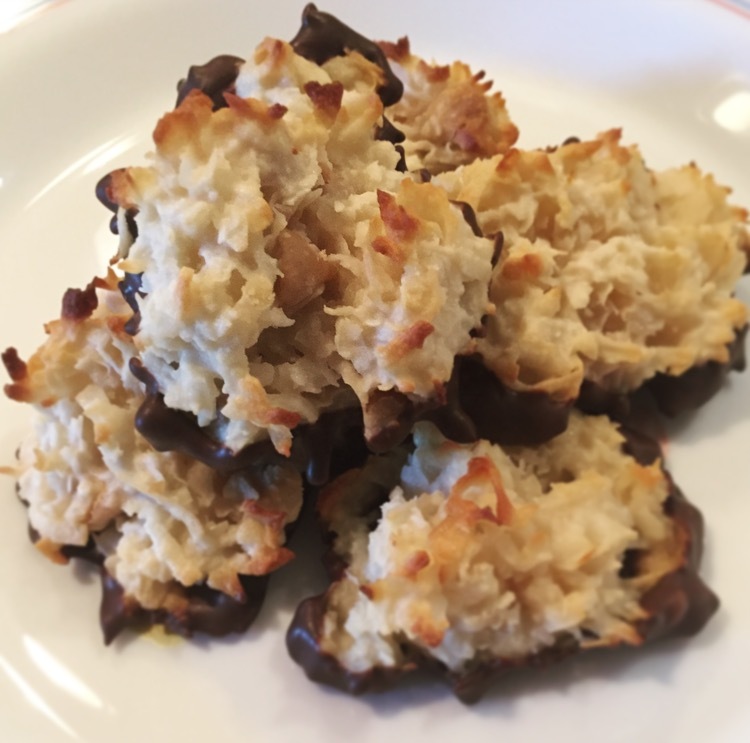 I had a coworker try both my original plain coconut macaroons and she loved them but definitely fell in love when she tasted the chocolatey sea salt caramel coconut goodness that is this recipe! Enough drooling onto my keyboard, let's get down to making these delicious treats so you we can eat them already! 14 oz (1 can) of condensed sweetened milk - I use Borden. 1. Preheat oven to 350 degrees. Line 2 cookie sheets with parchment paper and set aside. 2. In a large mixing bowl, mix together the coconut and flour until the coconut is evenly coated with flour. Add the condensed milk and using a spatula fold & blend into coconut flour mixture. 3. Add the almond and vanilla extract and continue to blend the mixture. Gradually add and mix the sea salt caramel chips into the coconut mix. 4. Once everything is mixed and chips appear to be evenly disbursed, using either a tablespoon or small ice cream scoop, place heaping tablespoon size amounts of the mixture onto the parchment paper about 1 inch apart. 5. Bake for 12-14 minutes or until tops of coconut have become golden brown. 6. Take from oven and let cool, set aside to cool. 7. In a small bowl, melt a large amount of the Ghiradelli Dark Chocolate melting wafers. I usually start with heating for 1 minute, then 30 sec intervals, stirring in between each interval. Once the chocolate is melted, dip the bottom of the coconut macaroons in the chocolate. Set aside and let the chocolate harden. 8. Once the chocolate has hardened, enJOY your delicious treat! I hope you enjoy this recipe as much as I do! I will be taking these when I travel to my family for Thanksgiving this week. I have not made these for my family before so I am hoping to wow them! Also, I am definitely looking forward to gobbling them up myself! These look soo yummy! Totally saving this to make later. I love baking. Thank you -let me know what you think!! I think they are absolutely fantastic! Yay :) thank you so much! Hope you enjoy them! Omg coconut macaroons are one of my favorite treats ever. These look so good!! These sound so amazing! I want to try this recipe this weekend! I didn't even know that Hershey's made sea salt caramel chips! These macaroons look delicious. I loveee sea salt in desserts, so this is right up my alley! Thanks for sharing! I don't know why I've never made macaroons before! These look heavenly!! Oh my gosh Joy, these would be my favorite dessert!! I need to make them!! I'm obsessed with sea salt caramel and adding chocolate is genius! This looks INCREDIBLE. SERIOUSLY. WOWOOW. Ok I wish I liked coconut because these look DIVINE. SERIOUSLY. SO GOOD.